InternationalLiving.com ranks the world’s best retirement havens, and among them are some of the most romantic places on the planet to enjoy Valentine’s Day. International Living ranks the top five most romantic locations on their beat. Costa Rica is a lover’s paradise, and its Southern Zone is especially full of natural beauty. With little large-scale development—no big towns, no large resorts, no condo towers on the water—and several protected national parks and wildlife reserves, the area remains quiet and free of large numbers of tourists. It’s not unusual to have entire beaches to yourself, making it possible to walk hand in hand for miles on golden sands without seeing another soul. Most expats live on the hillsides above the water, in houses surrounded by lush rainforest home to sloths, toucans, monkeys, blue morpho butterflies, and more. Human neighbors are hidden behind foliage and out of earshot. It’s the ultimate private retreat. But despite the unspoiled nature of this relatively isolated area, there are countless choice venues for a romantic dinner. Some of the best restaurants in Costa Rica are found in one of the main villages of the Southern Zone: Asian, Italian, Mexican, French, and more restaurants run by enterprising expats who were either chefs or foodies at home and decided to showcase their culinary prowess in their new home. This little rock in the Caribbean Sea sees a steady flow of tourists year-round, bringing new faces to the beaches and laughter to the beach bars. Add all those tourists into an already eclectic mix of locals and expats, and suddenly it seems that romance is everywhere. Roatán boasts one of the most affordable costs of living in the Caribbean, and it is the easiest place to fit in as a new expat. Social gatherings are held daily, new people enter the mix constantly, and love is always floating along through the tropical breeze. Single expats find the stunning beaches and rustling palm trees of Roatán an easy place to socialize and look for potential partners. Romance wasn’t foremost on the minds of Edd and Cynthia Staton when they first visited Ecuador back in July 2009. They had their sights set on Cuenca as a possible retirement location and arrived to spend time looking for red flags that might cause them to search elsewhere. They instead fell in love with Cuenca’s charms and left with a firm decision to move there. After days of wandering around an unfamiliar place with a different language and culture Edd and Cynthia were exhausted, so they decided to splurge and treat themselves to an overnight stay at Mansion del Angel in Quito. They immediately fell for the gorgeous antiques, oriental rugs, and fresh flowers everywhere. Their bed and bathroom were sprinkled with red rose petals. They had lavish breakfasts on the verandah and afternoon teas in the parlor. When they finally got to Cuenca, that city didn’t disappoint either. Beautiful colonial architecture and cobblestone streets in the historic center and a tranquil river separating Old and New Town offers settings that just beg for a hand-in-hand stroll. With two dozen fresh-cut roses from nearby greenhouses costing $4 and Ecuador’s world famous chocolates for sale all over town, tokens of love aren’t reserved for only special occasions. When the occasion is special, Cuenca offers an ever-expanding choice of outstanding restaurants and boutique hotels. Or just outside the city is a fantastic spa with hot springs, mud baths, and an enticing menu of amenities. 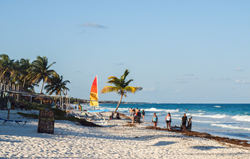 If your notion of a romantic get-a-way includes warm tropical breezes and brilliantly clear, turquoise Caribbean waters lapping onto white sand beaches, few would argue against Mexico’s Riviera Maya. This 80-mile stretch of spectacular beach is the Caribbean’s most visited vacation destination, and for good reason. The tiny, picturesque village of Puerto Morelos is among the area’s most romantic locations—with its old, picturesque leaning lighthouse and small, colorful fishing boats bobbing a few yards offshore. Accommodations range from basic to luxurious a short distance from the village center and the fresh seafood is amazing everywhere. This area is also filled with lush, tropical jungles, which can be explored by zip-line tours, quiet romantic hikes, or bicycles. Underground rivers and cenotes provide opportunities to explore hidden caves for swimming and snorkeling among ancient stalactites and stalagmites as well as secluded nooks for romantic interludes. Holding hands while walking the same paths as ancient Maya lovers, one could easily fall under a romantic spell cast by shamans a millennium ago. For a romantic getaway in Panama’s Chiriquí Province you can’t do better than the Los Quetzales Eco Lodge. High up in the clouds at the edge of the rainforest, this charming B&B and spa has everything needed for a couple’s retreat. The main lodge is a two-story wooden structure that almost feels like an alpine lodge, especially when the fireplace is glowing on a chilly night. Chalets, cabins, large suites and standard hotel rooms are all available to match any romantic mood. Guided tours set out each morning—choose from hiking, horseback riding, bird-watching, and bicycling to explore the mountain trails. Visit a coffee farm, a botanical garden, an archeological site, or just stroll the landscaped gardens alongside the stream. The full report on International Living’s most romantic retirement destinations can be read here: The World's Most Romantic Retirement Havens. Editor's Note: Members of the media have full permission to reproduce the articles linked above once credit is given to InternationalLiving.com. Media Contact: For information about InternationalLiving.com content republishing, available source material or to book an interview for radio, TV or print with one of our experts, contact Associate Editor Carol Barron, 772-678-0287 (US), CBarron(at)InternationalLiving(dot)com or visit the Media Center.